Zhao Cong is a Beijing-based experimental/improvisational musician. In addition to performing in live events in Beijing such as Zooming' Night, organized by composer/performer Zhu Wenbo, she has in recent years been expanding her range of activity, visiting Japan each year and performing in various locations around the country. She has also released solo and duo albums on Zhu Wenbo's cassette label, Zoomin' Night. 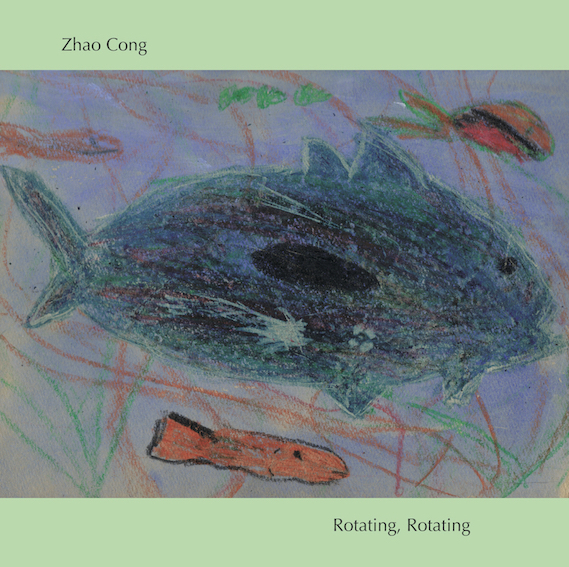 This CD contains three solo tracks by Zhao Cong. Tracks 1 and 2, each about 20 minutes, were recorded at her home in Beijing in June 2016. Track 3 (about 29 minutes) was recorded in concert at Ftarri, Tokyo, in January 2018. 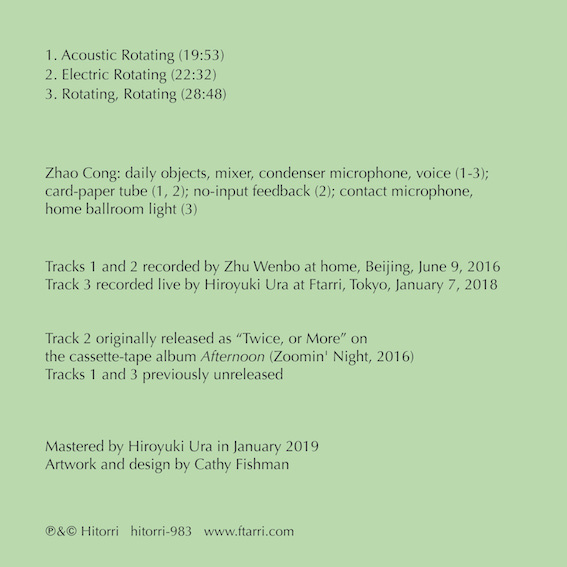 Only the second track is previously released--on Zhao Cong's debut solo album, Afternoon, a cassette tape that came out on Zoomin' Night in 2016 and has since sold out. On that album the title was "Twice, or More," and on this CD it has changed to "Electric Rotating." Tracks 1 and 3, respectively called "Acousting Rotating" and "Rotating, Rotating," are previously unreleased works. Zhao Cong arranges a mixer, a cardboard cylinder, household items, and a hemispherical lamp (whose small light has a visual effect) on the same table, manipulates mixer feedback and contact mike, and produces delicate sustained sounds and (as if inserting them into the sustained sounds) numerous and varied noises. While her performance style and sounds are restrained, listeners drifting along in these sounds and the gentle flow of time are left with an indescribable and vivid impression. A masterpiece.